Today's Google Doodle, the famous British literary luminary Virginia Woolf inspired a generation of feminists. Virginia Woolf's works have been translated in more than 50 languages. New Delhi: In her non-fiction book 'A Room Of One's Own', English writer Virginia Woolf wrote, "A woman must have money and a room of her own if she is to write fiction." Today's Google Doodle, the famous British literary luminary Virginia Woolf inspired a generation of feminists. Her strong, hard-hitting works that use stream of consciousness as a narrative device, have left a deep impact readers' psyche, making her one of the most read and revered authors. 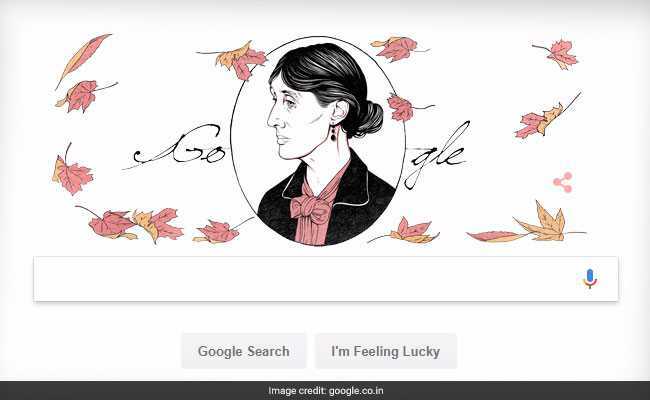 On her 136th birth anniversary, Google dedicated a doodle for the modern writer who was ahead of her age and times. So popular were her writings that her works have been translated in more than 50 languages. Virginia Woolf's first novel The Voyage Out came out when she was 23. The novel's central character Rachel Vinrace embarks for South America on her father's ship and is launched on a course of self-discovery. With focus on feminine consciousness, sexuality and death, the character's journey is said to be Virginia Woolf's personal journey from a repressive household to the literary world. Night and Day, Virginia Woolf's second novel came out in 1919, four years after The Voyage Out. This novel examines the relationships between love, marriage, happiness and success. Virgina Woolf's third novel Jacob's Room got published in 1922. The novel uses experimental and innovative style of writing. The central character in the novel Jacob does not exist as a concrete reality, but rather as a collection of memories and sensations. Virginia Woolf's fifth book, To the Lighthouse came out in 1927 and highlights childhood emotions and adult relationships in a neatly-weaved story around the Ramsay family and their visits to the Isle of Skye in Scotland between 1910 and 1920. Orlando came next year in 1928 and is biography of the aristocratic poet and novelist Vita Sackville-West. He is said to be Virginia Woolf's lover and close friend. It was generally viewed as a novel with high literature which was also gossipy in nature. The Waves got published in 1931 was again one of Virginia Woolf's experimental writings in which soliloquies have been spoken by book's six central characters. Through these voices the author explores the concepts of individuality, self and community. The Years was Virginia Woolf's last novel to have been published during her lifetime. The book revolves around the Pargiter family and focuses on the small private details of the characters' lives. Between the Acts was published shortly after Virginia Woolf's death in 1941. The story is centred around audience of a play from an English play and is set before the Second World War. Virginia Woolf, apart from writing fiction, also penned three popular non-fiction books. They are: Modern Fiction, The Common Reader and A Room of One's Own. Her famous short story collections include Kew Gardens, Monday or Tuesday, A Haunted House and Other Short Stories, Mrs Dalloway's Party, The Complete Shorter Fiction and Carlyle's House and Other Sketches. Apart from her short stories, novels and non-fiction works, she has written several essays, autobiographical writings, letters and diaries.